This holiday season, the Body Shop is a great one-place stop for everyone on your list, especially with their great selection of gift sets. To make things even sweeter, this season, for every Body Shop Holiday gift, they have partnered with Water Aid and will donate one day of safe water for a family in Ethiopia. One gift = one day of safe water. Here are some of the gift sets I tested out, to give you some great gift ideas… and if you scroll down to the bottom of this post, you can enter to win a Body Shop Gift Set for the holidays in my giveaway! You can’t go wrong with one of the Body Shop’s Premium Selection Gift Sets! The Satsuma is a classic, fresh scent that anyone will love. I really liked how this package came with a massive body butter and hand cream I could keep in my purse. The Gift Cubes are a great gift to stock up on for Secret Santa, while the classic Festive Crackers make perfect stocking stuffers! I love the scent of the Italian Fig, while the strawberry cracker is intoxicating! 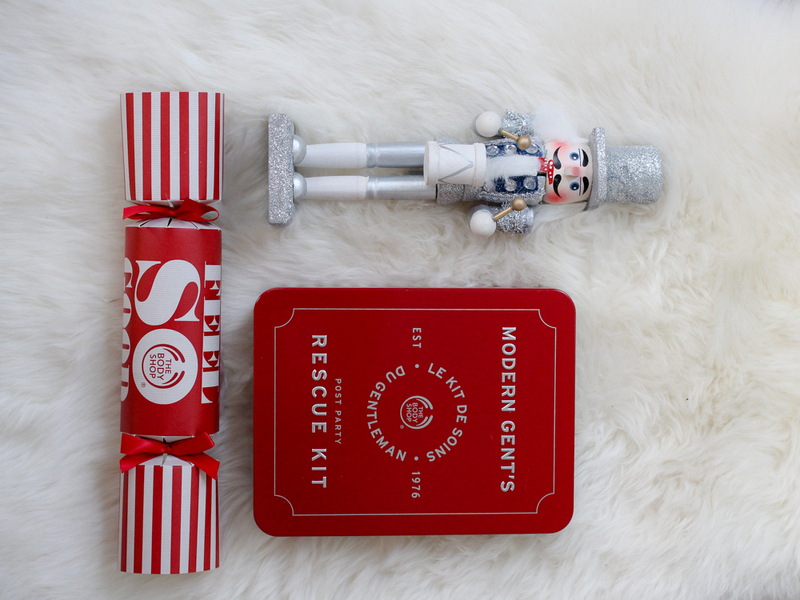 I love that these gifts come pre-wrapped and am so excited to give my boyfriend the Modern Gent’s Post Party Rescue Kit. Complete with Maca Root Eye Rescue Serum (perfect for those nights with too much egg nog) and a 100mL Face Protector, this male grooming kit comes ready to give in a stylish, red tin. It kind of reminds me of a first aid kit, so when he’s done with it, he can repurpose the package to store other essentials. One thing I love about the Body Shop during the holidays are their limited edition scents. The Frosted Plum Lip Balm is my new favourite scent. It’s not to sweet but feels very wintery and festive. Frosted Cranberry is also a great scent too, I use this bar in my lingerie drawer as a scent block to slowly release a pleasant, fresh smell! I’m super excited to be giving away this Oils of Life Skincare Collection from The Body Shop! Face oils are a huge trend in skin care, and this set is an incredible value. Complete with three seed oils from around the world, this oil and complimentary face cream will soothe your dry winter skin. You can be the lucky winner of this indulgent set, along with a scent cube… just fill out the form below. Please note, this is only open to Canadian residents. I have my inlaws visiting for the holidays so we will mostly staying at home. I’ll just be staying at home with the boyfriend. I am so excited, my partner and I are spending our first Christmas in our apartment together. Were going to remember this forever! We’ll be celbrating with our daughters, their partners and their new babies! I am celebrating with my husband at home. It will be a quiet holiday but we are going to Mexico in January for our present to each other. My eight-year-old daughter and I just made a list of all of the things we want to do this week, like decorate the tree (we just brought one home this weekend! ), make a gingerbread house and cookies for Santa and hang the stockings. And maybe go to IKEA because well, IKEA!! We’ll be home for Christmas but travelling between Christmas and NY’s to visit family. I am staying around and hosting Christmas and the New Year. I’ll be spending the holidays with my parents, grandparents, and siblings. I’m hosting Christmas at my house this year. I plan on spending the holidays with my family and friends. I am spending the holiday with my family this year. Spending it with family & friends… my home their home – parties at restaurants. Spending the holidays with my family. Hello, I am spending my holidays relaxing with family, and eating lots of treats! I”ll be spending the holidays with my family. I’ll be vacationing to Hawaii for Christmas and New Years to relax and visit some family! We’re spending the holidays with family.